Fisheries are one of the emerging sectors in India which engages 14.5 million people at primary level. Since the last many years, the production from marine fisheries has declined and production from inland fisheries has increased. The major activity in inland fisheries is cage fishing. NGO Shashwat in Ambegoan block of Pune district started cultivating fingerlings in cages given by CIFE but those cages had some problems and NGO requested RuTAG IIT Bombay to work on the design of new cages. This paper focuses on the study of earlier cages and problems associated with it, approach and methodology adopted by RuTAG IIT Bombay to design new fish cages. This paper also helps in understanding the major components used in RuTAG fish cage structure. “Floating fish cages for inland waters” developed by RuTAG IIT Bombay are sturdier and safe for working on it as compared to CIFE cages, which were used by local fisherman cooperative society initially and appreciated by Tribal Development Department, Government of Maharashtra and Ministry of Development of Northeast region, Government of India by giving fund for dissemination. 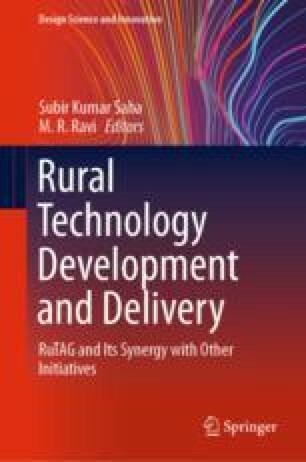 The authors are grateful for funding and support from the Office of Principal Scientific Advisor to the Government of India, for giving the opportunity to work on the project under RuTAG IIT Bombay. The authors are thankful to Dr. Ketaki Bapat for kind support during the project and dissemination activities. We wish to extend our gratitude to late Shri. Anand Kapoor and Shri. Budhaji Damase from Shashwat along with the members of Dimbhe Jalashay Shramik Adivasi Machhimar Sahakari Sanstha Maryadit. We would also like to thank Dr. Rupali Khanolkar, Project Manager, RuTAG IIT Bombay for her kind support. All procedures performed in studies involving human participants were in accordance with the ethical standards of the institutional and/or national research committee and with the 1964 Helsinki declaration and its later amendments or comparable ethical standards. Informed consent was obtained from all participants included in the study.